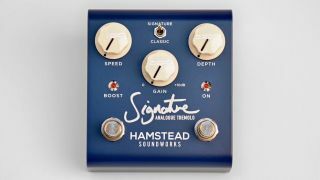 With its hand-built Artist 20 line seeing action with the likes of James Bay, Carl Verheyen and Jamiroquai's Rob Harris, Hamstead Soundworks has seen fit to release a standalone version of 20+RT's tremolo circuit - enter the all-analogue Signature Tremolo/Boost pedal. Two modes - Signature and Classic - deliver sine wave tremolo and output-bias-style tremolo for Hamstead's signature sound and vintage tones respectively. Elsewhere, a clean gain boost control can be used to boost the tremolo output or run independently to beef up the front end of any amp, while the pedal can be powered by any 9-18V power supply and offers a choice of true or buffered bypass. The Signature Tremolo/Boost is available now for £199 - Hamstead Soundworks has more.